We just received a Christmas card from the kids, nothing unusual about that I hear you say and you are so right – normally. It read “To Mum and Dad, Seasons greeting, Miss you both! Don’t worry we are getting lots of treats up in ‘dem dare hills. Love Zipper & Pringles. 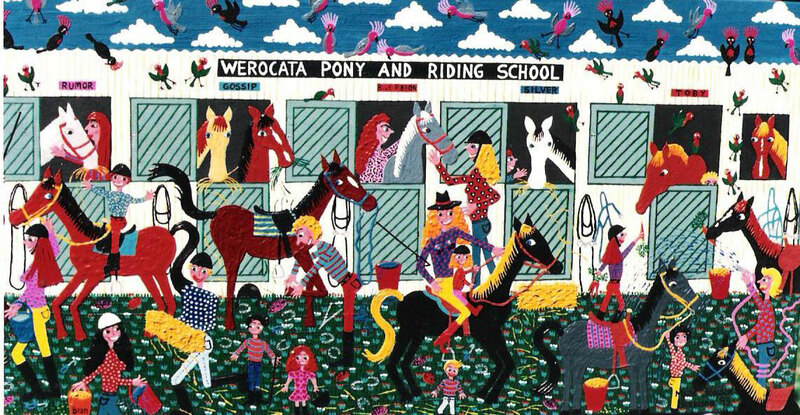 This naive acrylic painting depicts the Werocata Pony club which was located next door to our property for many years (that’s me on the left kissing my horse Rumor). Back to the greeting card and we were tickled pink, as it was from our little miniature horses we had on the farm and their lovely new owners, who must have helped them with the spelling, lol mm.. maybe? They are the cutest little misters around, Zipper is a gelding and Pringles a stallion and a very frisky little one he was too. He would try to have a go at Zipper who was most put out and not at all interested in Pringles advances. When that would not work he would be chasing my big horse Cally-she however was very interested and happily backed up to towards him, their only stumbling block was that she was more than twice as tall as him and there was no way that he could ever reach. So when that had come to nothing and poor little Pringles still had the urge he would have to scale the fence and try to find some lovely ladies somewhere else. It happened quite a few times that my husband would come in and tell us we all had to hop in the car to go and try to find the little Horny Mr! Once he had a female in his sight (the neighbor’s horses) nothing would lure him back home, we tried apples and carrots and stern words and praise, but in the end we had to try to come in from all four sides and throw a rope around his neck and the walk him back across the paddocks of the farm. Of course he would still be ducking and weaving and doing loop the loops to get back to the pretty girls. In the meantime Zipper is patiently waiting for his companion to come back and probably enjoying the peace and quiet for a little while. 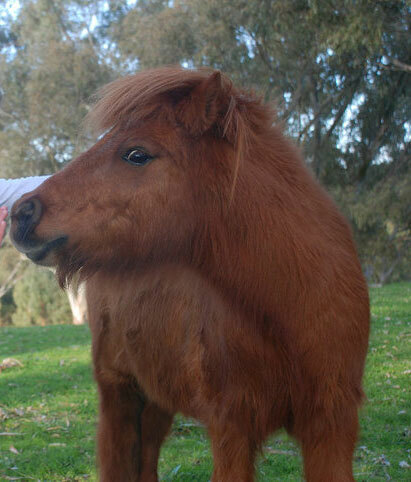 Zipper had won a couple of ribbons at Pony club, well not really any big deal in the horse world but very cute. Zipper belonged to our son Kai who was no more than 10 years old when he led the little horse around a little obstacle track and got a purple ribbon to show for it. When we recently moved from the farm I found the bag of ribbons from the various horse shows but neither kid wanted to pack them, but I think we still took them, it’s hard to throw away all those memories! So has the frisky little Pringles mellowed with age I hear you ask, well not according to the horses new mum and dad, Pringles does still, if the occasion arises so to speak, lol take off for dem dare hills to look for cute girl horses. Therefore I think some wise words from Winston Churchill (British prime minister) is in order here although I think Pringles only listened to the first part before he took off!